Lucrative gains from annual religious pilgrimage has the Saudi Ministry of Finance clamoring to build the world’s largest hotel in the desert of Mecca, featuring 10,000 guest rooms, four helipads, and 12 tightly clustered towers on a 10-story plinth. Crowned at its summit by one of the largest domes in the world, the $3.6 billion mega-hotel has five off-limits floors earmarked for Saudi royalty, 70 restaurants, and an entire multi-function commercial space at its base for a shopping mall, food courts, a bus station, conference center and a lavishly appointed ballroom. 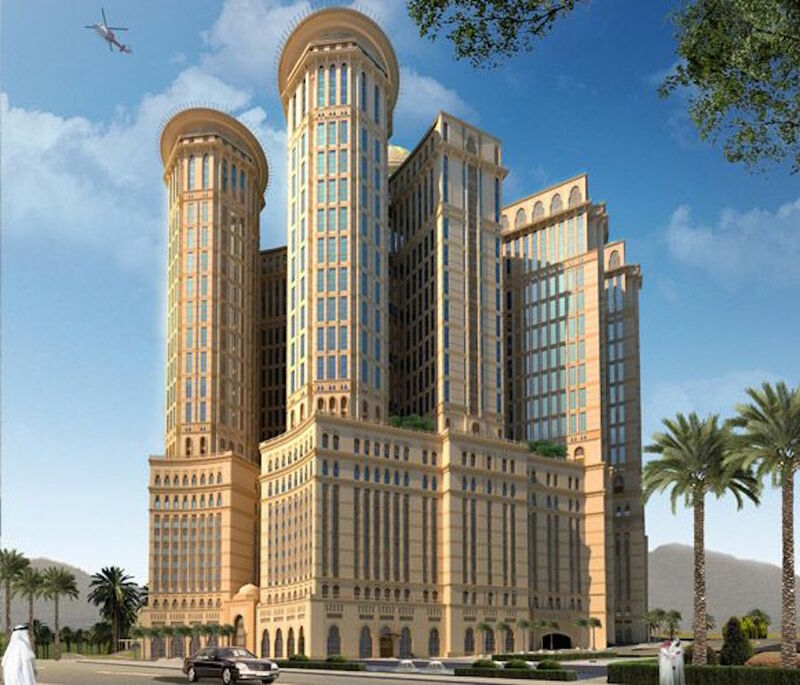 Construction conglomerate Dar Al-Handasah designed the mammoth edifice to model a “traditional desert fortress,” sporting flourishes such as fluted pink pilasters framing arched blue-mirrored windows. 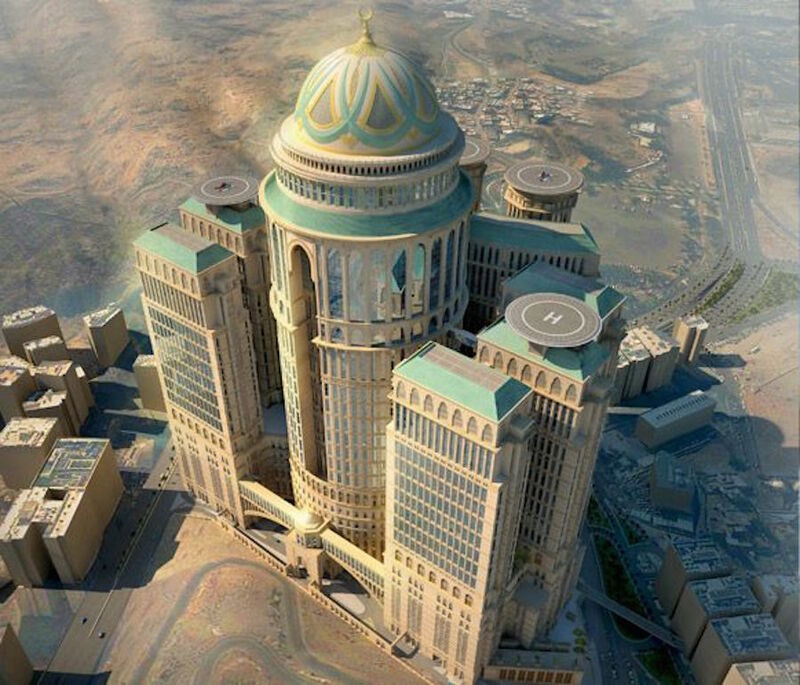 The two towers within the dome will rise up 45 storeys above the Mecca desert, while two more towers will attain 35 floors, with the remaining eight towers at 30 storeys tall. London-based interior design firm Areen Hospitality has signed on to appoint the interior spaces in the palatial luxury typical of the region. While deep pockets are an unspoken mandate, guests can choose between four and five-star luxury accommodations. 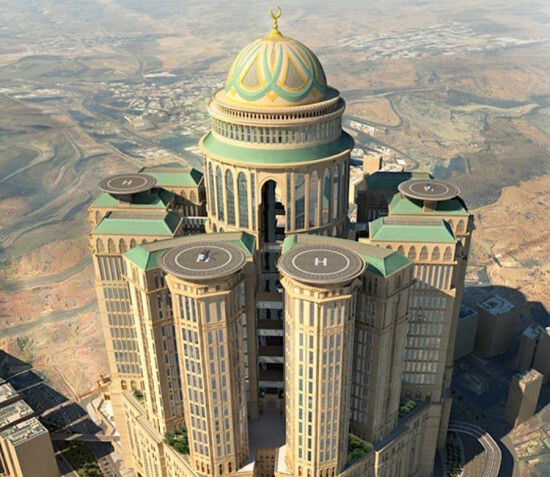 The hotel occupies a 646,000-square-foot site in the Manafi district, and is less than one mile south of the Grand Mosque, thronged by two million pilgrims per year and currently undergoing a $61 billion expansion to accommodate seven million worshippers by 2040. The world’s largest hotel by number of hotel rooms, soon to be dwarfed by the Abraj Kudai, is the MGM Grand Las Vegas at 6,198 guestrooms. The gargantuan construction, opening in 2017, is the latest in a spate of residential and commercial developments galvanized by rising tourism revenue, currently raking in more than $9.2 billion annually.